My suitcase isn’t packed, but my knitting’s ready! Would you like to see? I wound 3,166 yards of yarn today (and 218 yards on Sunday; one of the projects is already underway) – nine cakes plus Sunday’s one for a grand total of ten. Five of those cakes (and nearly one-third of the yardage) is for 2nd Avenue. It’s a very colorful (and most uncharacteristic for me 😉 wrap with a LOT of stockinette. Yep, this is my social/cocktail project. I plan to cast on tomorrow morning en route (accompanied by a mimosa). Four of those cakes are for Whiskyfied. Melanie Berg gifted me this pattern as a thank you for test-knitting A Twist to it. I told her I was planning to knit the piece as a souvenir for an upcoming trip…and that I hoped there would be no whisky spilled on it (gin, maybe, but definitely not whisky). I’m a few repeats into the first chart and the pattern is clear, rhythmic and surprisingly addictive. This is also in my carry-on for tomorrow – but I can’t get too far – the other three balls are going in my checked bag! Last but by no means least – socks! I fell hard for the NoShow Socks when the pattern came out last month. 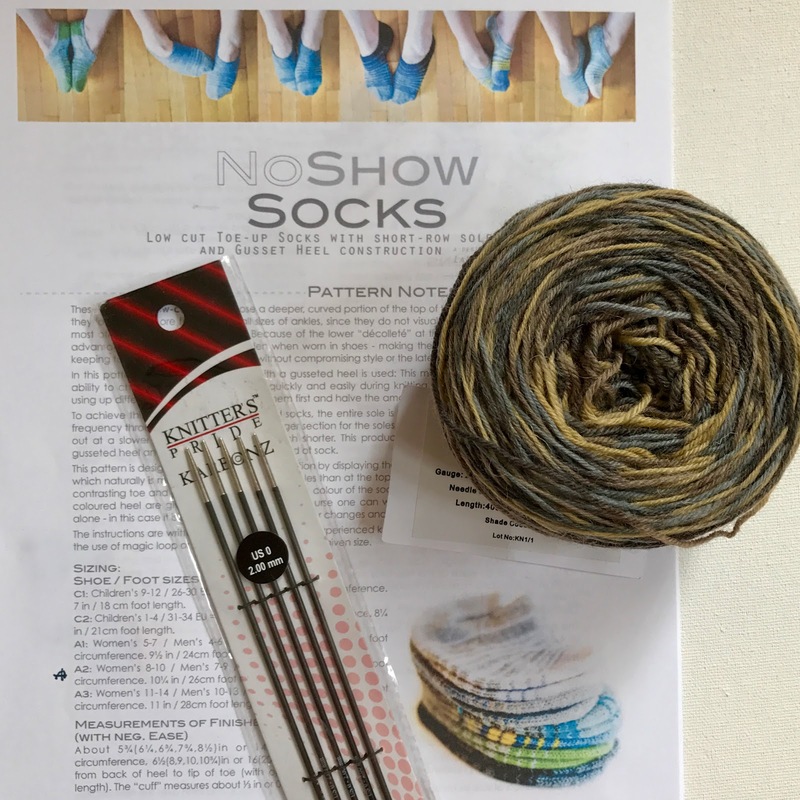 It’s been ages since I knit socks (and those size 0 needles are brand new – yep, a first!). But the pattern promises to teach me a few new techniques and I actually wear no-show socks. Plus I have a lovely skein of souvenir yarn from my sister’s trip to Scotland last year. Lydia and I will be knitting these together. over coffee, I’m thinking. 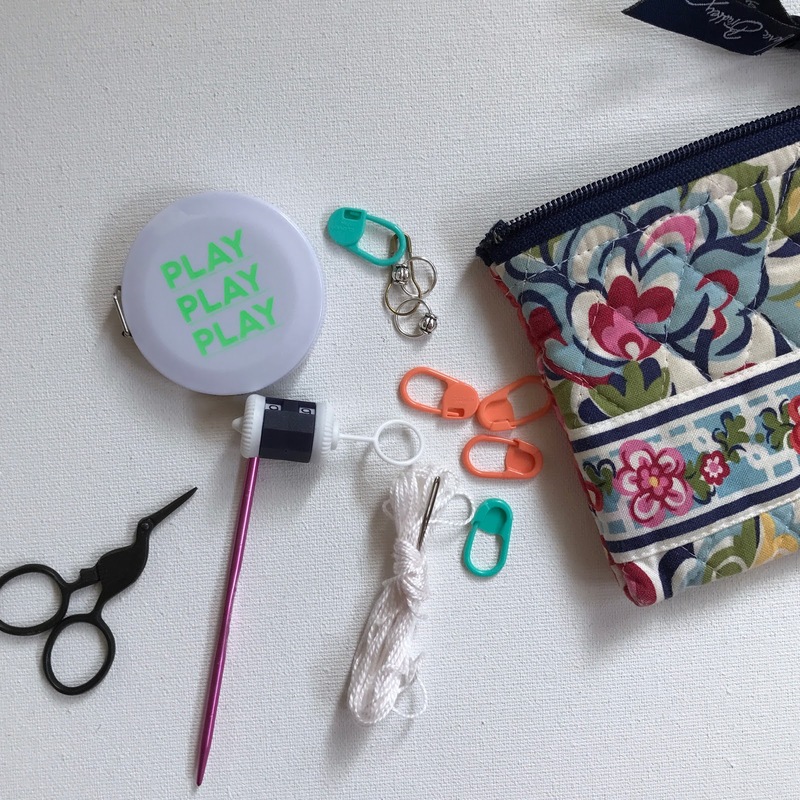 I’ve also put together a very streamlined knitter’s toolkit. Thinking through the three projects, I shouldn’t need much, but I want to be prepared. Do you see anything missing? …and the million dollar question – how much of this do you think I’ll actually knit while I’m away (remember, I’m gone for two weeks!)? leave your answer in the comments! 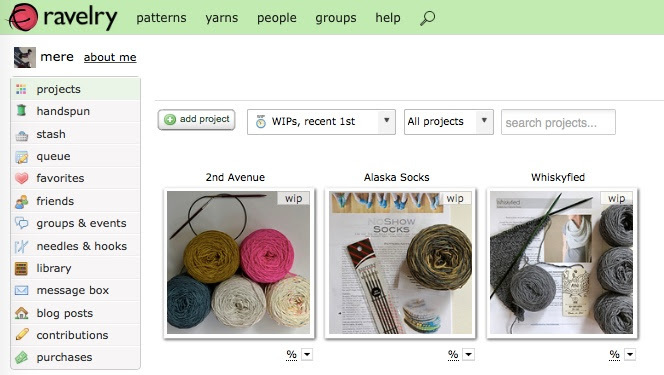 You would have all three projects done in two weeks if you were knitting at home, but in Alaska? 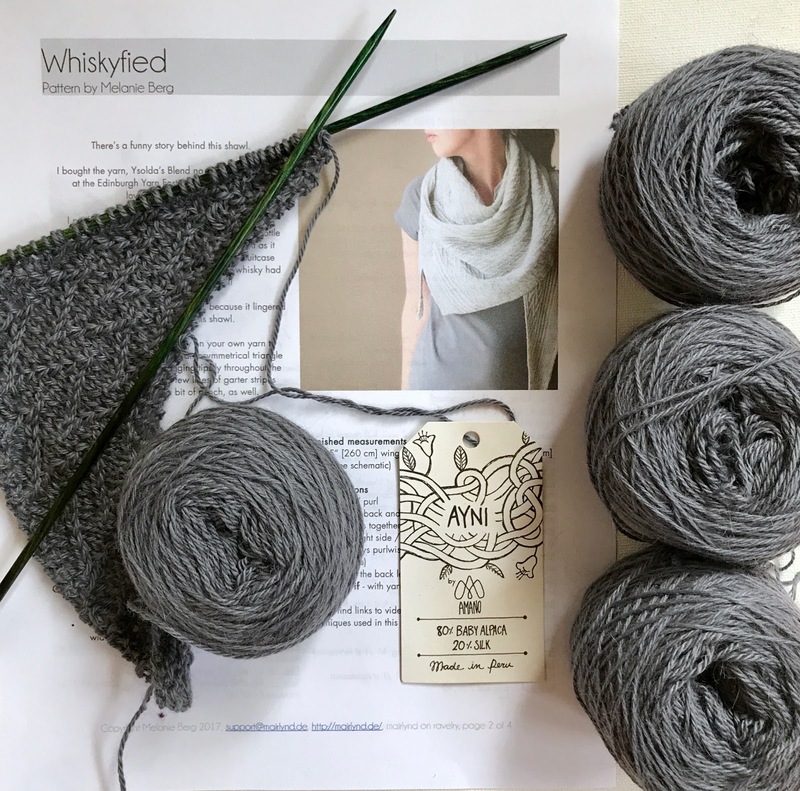 I'm going to guess a completed Whiskyfied (that looks like really nice yarn! ), a completed pair of socks, and maybe 30% of 2nd Avenue? Or … maybe Alaska will be so beautifully picturesque that most of your knitting will be on the plane! However much you actually knit, have a truly wonderful time! I guess you'll do very little! But at least one project will come back completed (or near completion). Have fun and come back with beautiful memories! I predict you will be 50% done with the socks, 25% done with 2nd Avenue and 10% done with Whiskyfied. Have a grand adventure! Yahoo! I always pack way more knitting/sewing than I actually do, but I'd rather have too much than too little!! Ha, glad to see we were on the same page. 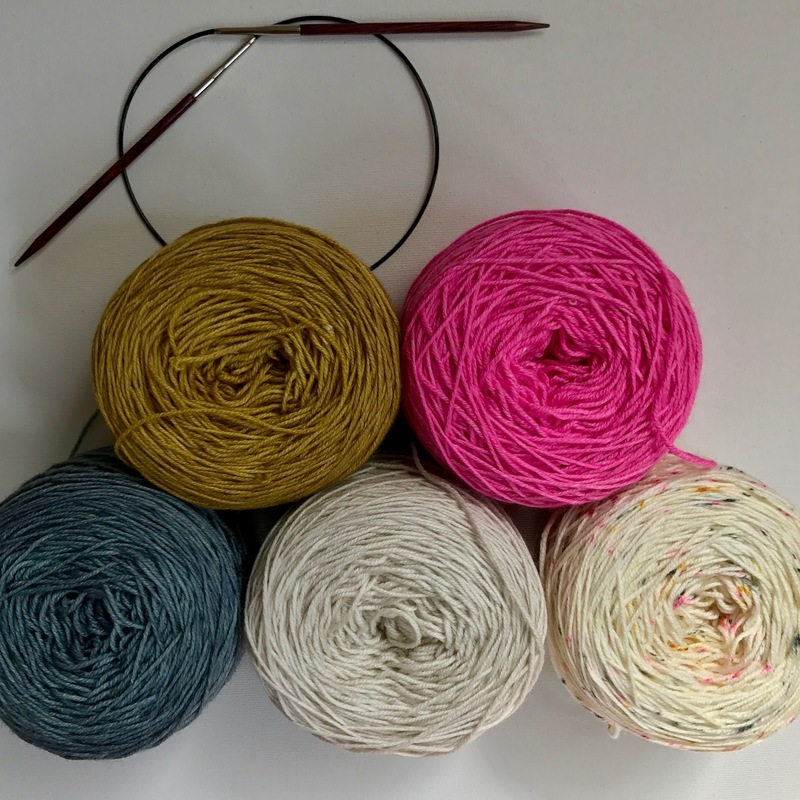 I have 5 cakes of Berroco worsted in a space bag in my suitcase, and that's not all the knitting either! Did I mention the embroidery I brought . . . If your vacation goes as mine has this week…very little! Have a great time!! you will finish at least one project. I over pack every single time and I don't mind at all because I know if I don't that is when I will need a project in my hands immediately! I look forward to being surprised! Enjoy in between snapping pics!